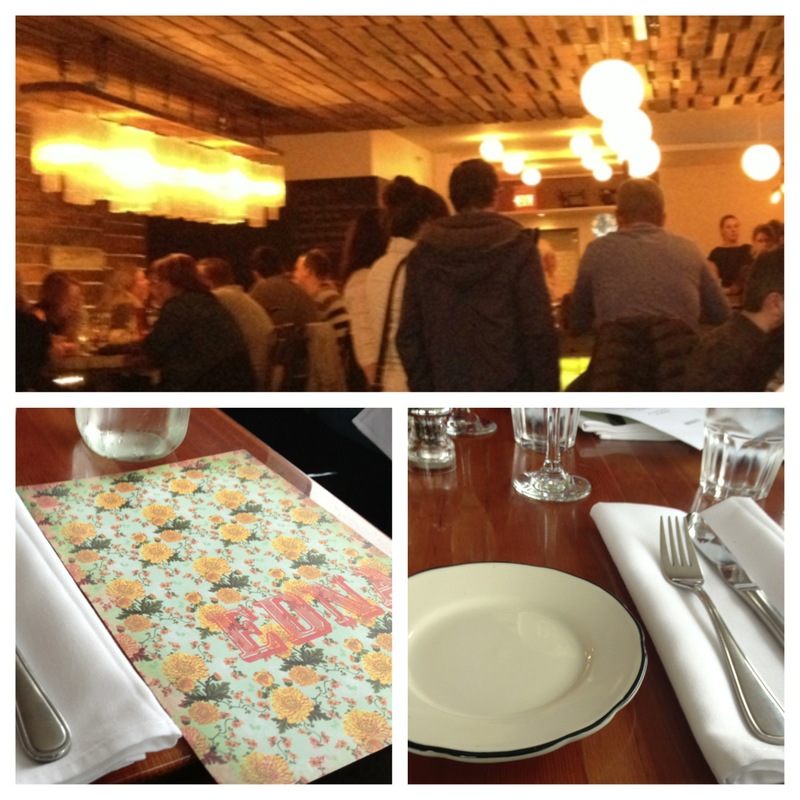 Halifax, say hello to EDNA, the north end’s newest restaurant! Opened last week by Jenna Mooers, daughter of Jane Wright from janes on the common, EDNA, which stands for “eat, drink, nourish, always” was buzzing with activity last night when I went for dinner. My first experience was amazing and definitely won’t be my last! Named after famed poet Edna St. Vincent Millay, the restaurant is located right next door to the newly relocated jane’s next door, across the street from Ratinaud French Cuisine, and sits in the newest food destination in the north end. My friend Erin and I entered the restaurant this past evening and were seated immediately by the window. EDNA is not taking reservations for the time being, so we were lucky to get a table: By the time we had our drinks, there was a line at the door! The restaurant is cheerful and trendy. The menus are all printed on different sheets of pretty patterned paper, and the clean lines of the cutlery and glassware compliment the decor. The juxtaposition of raw wood ceilings, painted board, and industrial shelving and lighting creates a unique and comfortable atmosphere that feels metropolitan and local at the same time. The furniture is eclectic, yet modern and clean with rich wooden tables and metal chairs. The bar is constructed with painted black pipes, dark wood, and white subway tile. Across from the bar is a long high wooden table that seats at least 25 people and sits underneath a long geometric chandelier. The bathrooms were probably my favourite part with dark blue ceilings, peacock floral wallpaper, and antique light switches that make me nostalgic for my grandparent’s old house. Every detail has been considered, and contributes to the awesome atmosphere of EDNA. We were greeted by our awesome server Moriah, who took our drink order. 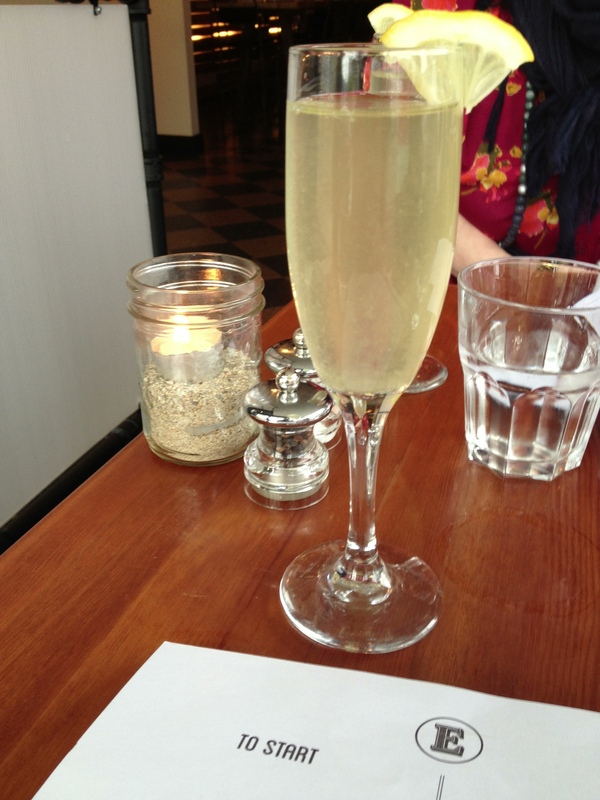 Erin and I both chose the French 77, which contains Elderflower liqueur, lemon, and sparkling wine. It was delicious! The drink list contains classic cocktails, awesome local wine and beer, and even cider on tap, which I always appreciate. After ordering our food, we were brought fluffy, thick bread that was served with creamy butter. 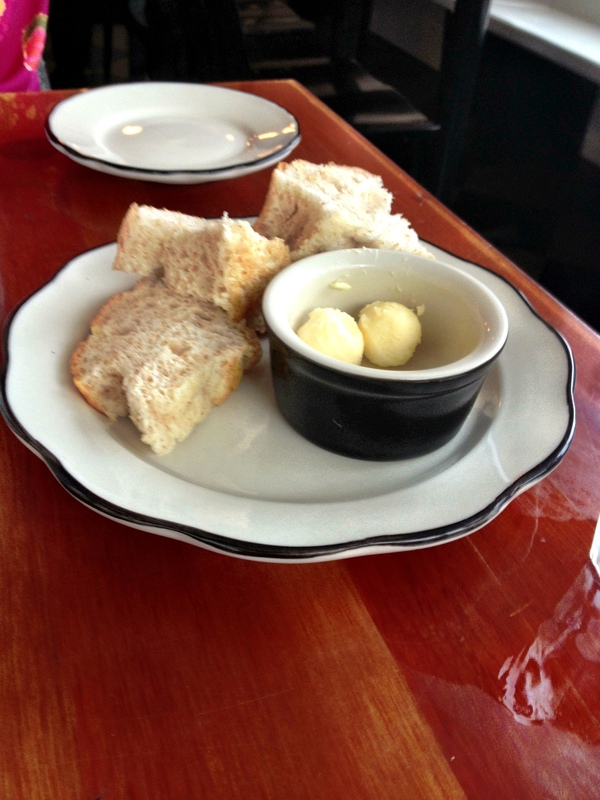 Normally, I wouldn’t mention such a simple amuse-bouche, but the butter is worth talking about. The saltiness was prominent in a good way, I am talking crunchy bits of salt that made it more decadent and yummy than your run-of-the-mill table butter. The bread was homemade, fresh, and oh-so-soft. 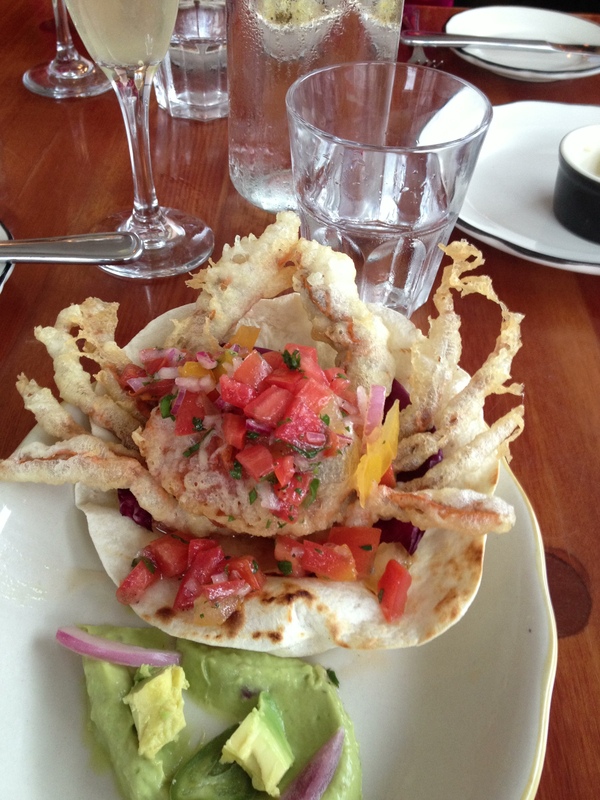 To start, Erin chose the Soft Shell Crab Taco. It looked amazing! They had fried the whole crab and served it upon the taco in the most awesome presentation. At first, Erin wasn’t sure how to eat the taco, but Moriah instructed her to just dig in and eat the crab whole! Erin loved the avocado mousse that accompanied the taco, and raved about the spicy salsa that topped the creative crustacean. 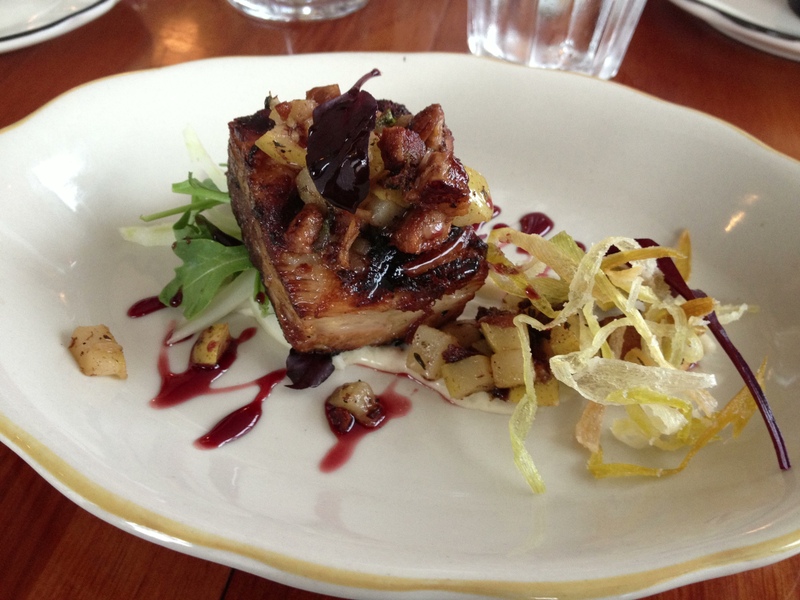 I had the Pork Belly to start and it was also delicious! Served with diced pear and very thinly sliced lemon rind, the sweet and saltiness of the dish was everything I could as for. The pork itself was prepared perfectly, with the soft meat melting in my mouth, I barely needed to use my knife! When the mains arrived, we oohed and ahhed at the whimsical plating of Erin’s choice, the Arctic Char. The fish was served with root vegetables, edamame, and wild mushrooms. 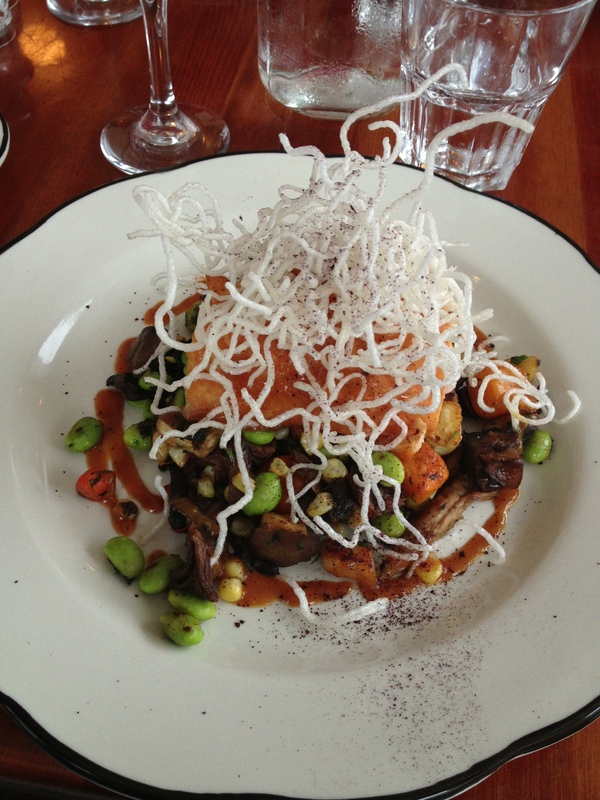 Topping the delectable dish were crispy rice noodles that gave an excellent opposition to the flavours of the meal. Erin loved it! My choice was no less delicious. I chose the NS Butcher’s Cut of the evening, which was a 6 ounce Sirloin. 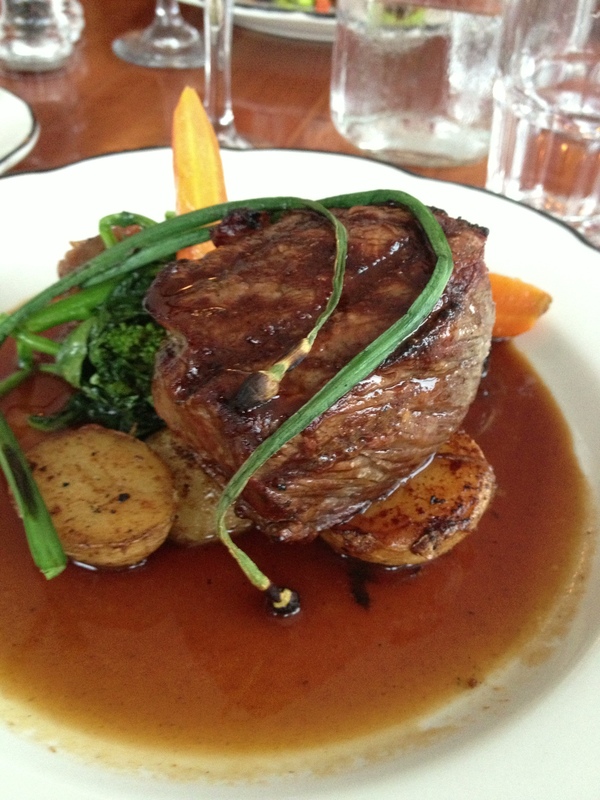 The meat was prepared to a perfect medium rare, and served with potatoes lyonnaise. The fresh greens and carrots that accompanied were coated in the delicious flavourful sauce; the simplicity of this dish was a true triumph. Though the dessert menu looked extremely tasty, both Erin and I were just too full of food and drink to order a final treat. But I am looking at this as a reason to go back again very soon! The food at EDNA by Chef Robert Reynolds is fresh, local, and innovative and couldn’t be more delicious. I loved the attention to detail and the delightful simplicity of this place, and the service was amazing. I am excited to see how this restaurant grows and evolves and encourage everyone to take a stroll up Gottingen to Explore. Eat. Repeat (many times) this new restaurant! Bravo Jenna! Cost: About $140 including tax and tip for 2 apps, 2 mains, and numerous beverages for the both of us. There is a large price range on the menu and it is very reasonably priced, for example, the $5 local cheese and charcuterie prices. Things I liked: The decor, the attention to detail, the food…pretty much everything! Things I didn’t: That I didn’t leave room for dessert! Best place to sit: By the window for date night, or at the big communal table for a night out with a group of friends. What to order next time: Local charcuterie and cheese, and more cocktails! I must try that soft shell crab taco!